Stephanie Sims is a recovering investment banker, speaker, author and the founder of Finance-Ability. She gives founders the knowledge, tools and self-awareness they need to find the right money for them, and has helped her clients raise over $30M to grow their businesses. 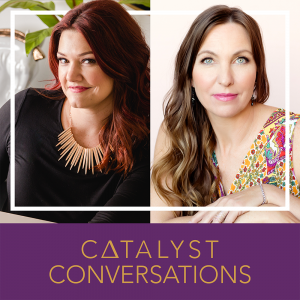 In this episode of the Catalyst Conversations podcast, we talk about overcoming our fear of the numbers (and why we don’t want to know what’s happening in our businesses financially to begin with), the types of funding available and how to know which is the best for your business. Get Priority Access to Jennifer’s latest events and programs. JM: Hey, Stephanie. How are you? SS: I’m doing great, Jen. How are you? JM: I’m great. Thanks for making some time to talk with me. You are the funding expert and I’m so excited to talk to you because so many of my clients and the people that I talk to are super frustrated just around everything money related. Tell us a little bit more about what you do. SS: I laugh because they’re not the only ones. I run into this quite a lot. Money gives everybody a little bit of a headache even though we want more of it. Basically what I do is I give founders and entrepreneurs the tools, the knowledge, and the self-awareness that they need to find the right kind of money to grow their business. A lot of people immediately, when I say that, they’re like, “Oh, that means you work with venture capital and angel investors,” and I do. But honestly, most of the people I work with are able to avoid that kind of funding. I find that to be more successful. JM: That’s awesome. Talk to me a little bit about what are the alternative, I think that’s what comes to everyone’s mind when you’re growing a business like, “I need to find an angel investor. I have to go find some VC investors to give us some money then we can grow our business.” Sometimes I think business owners, especially those who are launching a startup, I don’t even know if they know what they would do with that money if they did go get it tomorrow, what are some of those alternative forms of funding and why might those be superior to working with what we think of is traditionally as an investor? SS: Yes, both. There are three areas of funding that I talk and teach people about, I call it bootstrap, borrow, or bet. Bootstrapping, I think we all kind of know what that is, that’s essentially building a business and raising money from the most important people who are your clients. Honestly, if you can’t raise money from clients, meaning you can’t get people to pay you for what you do, you don’t have a business for you to get start [inaudible 00:01:59]. JM: We need to backup, backup a step before we’re looking for more money. SS: Exactly, because money is not going to solve that problem if you don’t have something people want. I find that quite a few people get stuck in this concept of what bootstrapping is and they’re almost, I don’t want to say resistant, but they’re almost frustrated that they “have to bootstrap” and to me that has always made me laugh because I’m like, “Do you not want to be an entrepreneur? Because that’s kind of what having a business is about.” Bootstrapping is by and far the best way not only because you retain control but also because you have the ability to grow at whatever pace you’d like to grow at. You decide if you want to grow more quickly while you take up more clients and perhaps you add staff to enable you to do that. You do not depend on anybody else. Bootstrapping is one great way. The other way is borrowing which most people are probably familiar with, you go on to your banker and they’d say, “Hey, no problem. I can help you do that.” Borrowing can be right for some people but again you need to be very clear about what you want your business to be before you start looking for that kind of money. Because obviously if you can’t pay the money back every month, then it’s not going to be a great fit for you and it’s going to create more stress and more conflict than if you’ve just grown a little slower through bootstrap for example. JM: What are you doing? How is it going? JM: That’s really interesting. You’re right, so many times I think we see shows like HBO Silicon Valley and we kind of read magazines and we see these personalities like Shark Tank and we think, “Oh, we should be pitching like that.” That is somehow in of itself business success that you can successfully pitch your business to an investor and get money. We have really kind of started to worship that as success when, like you say, the vast majority of businesses don’t need that to be, and truly successful like really lucrative, strong, sustainable businesses that is not always necessary. But we do look at that as kind of being the pinnacle, ultimate way of building a business. What are some of the mistakes that you see? I mean, obviously, that’s one of them, it’s like going right to let me find an investor, that’s a huge mistake. What are some of the mistakes that you see especially women entrepreneurs when they’re looking for funding to grow their businesses? SS: I see [inaudible 00:05:20] but I think one of the biggest ones that I see is that we approach the funding process kind of backwards. We approach the funding process like, “I just need to find somebody to give me money. I don’t really care who.” I’m wondering if there is someone who will write their check, it’s going to be good. The reality is what we’re doing is we’re partnering with somebody for the life from our business. It’s kind of like getting married and so we need to build better jobs figuring out who a good partner for us would be before we start talking to them as opposed to kind of after we’re down the road and we realize, “Oh, wow, this is not a good fit.” I think one of the biggest things we need to do is put the paradigm on how we look for money by focusing on what we need first and what we want and then going out and finding people who support that. JM: Oh, my God. It really is like marriage. It’s like dating the bad boy. It’s like, “What are you doing?” How do you do that? I have always bootstrapped my businesses and the mindset for me was this pride that I did it myself and I didn’t owe anybody anything and that always felt so good. But I think when you’re looking at businesses where you really have to go and invest in machinery or equipment or you’re disrupting in industry and there is intellectual property and software to build, I mean you can’t get around needing money to do those things. SS: I think, first and foremost, it’s really the long-term vision you have for your business, are you trying to build a business that’s going to be a hundred million dollar valuation plus? Again, venture capital or angels might be a good fit for you, but if what you’re looking to do is build a business that is going to be, like you said, a very attractive, very lucrative, very sustainable business but you’d be happy with hundreds of clients instead of millions, then you need to reconsider, not because you couldn’t get the money necessarily but just because the money may not be worth it in the long term of how you see your business. Ultimately, it’s that alignment with the vision you have for the business that’s gotta be the first place to start. JM: That’s such good advice. Let’s talk a little bit about the opposite because here’s what I see also, the other issue around money—and I see this a lot in my clients—is what you call “number phobia” which I love. It’s the fear of looking at the numbers. When I started my business, as I got busier and more successful, I became more afraid to look at the numbers. I just didn’t want to think anymore about the bottom line. The top line looked good, that’s fine, like, “Just the top line looks good, we’re selling and everything is fine,” but then to have to really dig into looking at your billing statements and your profit and loss and what are the expenses that are maybe, they’re creeping up and we need to figure out why, or payroll’s getting a little crazy, or we bought a cremant on our credit card and the interest rates are crazy, sometimes it’s just like this overwhelming thing. I see this in my clients all the time where they either are afraid to look at those numbers or if they were to look at them, there’s sort of this lack of financial literacy where it’s, “I don’t even know what report I would look at. Do I go to Quickbooks? Is that a bank statement? What am I looking at?” Talk to me about number phobia and what you see in your clients. How do you help them to sort of get past that? SS: Yeah. I think you’re exactly right, Jen, that quite often in the early days when we feel like money is tight, we may pay more attention out of necessity because we just have to. We can’t make decisions without sort of checking all the numbers so that we know that we can actually pay for whatever equipment we’re going to do. But as we start to get to certain level of success, it’s easy, first off, because sometimes that’s the point where we outsource so we may have hired a bookkeeper or we may have brought somebody on who “take care of all that” so we feel like we’ve kind of outsourced it and it’s not a problem anymore. But I also think that one of the challenges is if we’re not capable of understanding how our investments in our business—and I say investment because quite often we talk about funding money in our business but really every decision we make is an investment in our business—if we’re not cognizant of how those investments in our business are supposed to be paying off, then we can’t really know that we’re making the right decision. Sometimes, you mentioned this a little earlier, but sometimes this applies not only just to the money part like not just the looking at your profit and loss statement or cash flow or whatever, but I’ve even worked with people who are afraid to look at metrics like they want to talk about the number of likes, the number of followers, the number of views they have on their social media. But that’s not driving clients, that’s not driving revenue so they’re kind of at that point where they feel like, “As long as I just keep doing what I’ve always done, somehow it’s just going to magically workout.” The challenge is every business is in a changing industry. There are always new competitors coming in. There are always new pressures on your clients for example to make maybe different decisions and if you’re not keeping your eye on every piece of that puzzle, there’s some simple metrix, something as simple as what’s my conversion rate on this [inaudible 00:11:24] campaign that I’m running? What’s my cost to require a customer? It’s not [block at 00:11:31] clients in terms of the math and once you set it up, you can look at it on a regular basis and just see, “Hey, wait a minute, all of a sudden Facebook is not the best platform for us to be advertising online. Maybe we need to be advertising somewhere else.” That’s not, [inaudible 00:11:45] PnL, that’s just making good business decisions. JM: Right. I think for me it was an issue of feeling like I don’t have enough time and you’re so totally right when you say you get to a place where it’s like, “Oh, my bookkeeper is dealing with that. I’ve just put that headache on that person’s desk. I’m not dealing with it anymore.” My first company is a social media company and so I’m super familiar with that too where people want to hire out their social media, they get to that place where they’re successful enough. Then it’s interesting because we have those clients who really are just like, “I want to see your reporting. How is it going? What do we do? What do we do?” But then it’s surprising, it’s really shocking to me how many of our client’s just sort of want to put it on autopilot and it’s almost like we become the bookkeeper where it’s like, “Nope, that’s your headache now. I don’t want to know.” It’s so interesting to me because I think, for one you have to keep your vendors and your employees accountable so you have to know what they’re doing, you can’t just sort of like leave it up to them and hope everything’s fine. But like you say, I often wonder where is the curiosity about if this is working, do we need to optimize it? How do we make those changes? Do you think that just stems from not understanding what they would change or is that fear of failure? Where does that come from? SS: I think it’s two things. I think we all naturally gravitate to things we feel comfortable and confident doing. In any situation, my tendency is to gravitate towards the numbers because that’s where I feel like I can understand things and make the best decisions. People who, for example, are really good at selling, people who are great with contacts with clients, they’re going to gravitate to that. I get that feeling that sometimes as we become more successful, we feel like, “Hey, now I can grow into what I’m really good at,” and I’m not saying that we shouldn’t focus on what’s the best and highest use of our time, you don’t have to do everything for sure, you should outsource, but as you said, one of the key things when you outsource is making sure that you’re still getting the right results. You can’t just outsource and blindly say, “Oh, that’s all working, I don’t ever have to look at it again,” it’s going to be like buying a gym membership and never going and thinking that you’re going [inaudible 00:14:02] membership. JM: What? I’ve never done that before. SS: No, no. I’ve never done that. For me it was always the really creative stuff in my business like I love talking about branding and choosing colors and taglines and looking at the visual aesthetic of a business. That’s great except for sometimes the highest and best use of your time isn’t the part that’s fun that you’re really good at. Sometimes, it is like the accountability piece and it’s holding yourself accountable. There is the accountability of your vendors and your employees but there’s that holding yourself accountable to, “Okay, I have to be the one that says, ‘This is going well and I’m going to leverage this,’ and I have to be the one that says, ‘This is not going well, how do we fix it or change it?’” Whatever that is, that is the highest and best use of your time. Sometimes I think that it is very hard, I mean it’s just human nature. We do want to stay in our comfort zone and highest and best use of time is not always comfort zone. SS: Yeah, and it’s really interesting that you bring up that whole making decisions to stop doing something because I do think that’s another reason that quite often people avoid metrics because not only does it put in your face this, “Hey, here’s a problem,” then it starts to say, “Well, maybe you made a bad decision,” which none of us like, the concept that we made a mistake or the concept that we’ve failed at something we tried. JM: That’s a very nice thing to put it right there. I think you did a great job. JM: Right, we’re not getting what we want like you said we’re not getting the desired results. This is a good segue, let’s talk for just a minute about how you got into your business because I think it’s really interesting. I especially love finding women experts because our audience is women entrepreneurs and I feel like the majority of financial experts, wealth advisors, financial planners tend to be men. I know you call yourself “the recovering investment banker” which I love and you know first-hand that this is a very male-dominated industry. How did you deal with that and then how did you eventually transition your way into your own business? Because I know you’ve talked about what it’s like to be the only woman in the room as an investment banker. How do you deal with that and what drove you to say, “You know what? I just can’t do this anymore. It’s time for me to go out on my own”? JM: That’s really helpful because that was going to be my next question to you because I know that you often say, “Know your worth, know your value,” and I know that you had mentioned a story where you were helping your mom and dad. Tell me a little bit about that time where you were helping them and what kind of informed your worldview that, “Hey, this is a big issue that people don’t know their value and their worth,” and how you help your clients get there? SS: Yeah, exactly. I was like, “Oh, yeah. I think I need a break.” But at that point my mom and dad had owned a business inside [inaudible 00:21:10] high school so at this point [inaudible 00:21:11] my age here but that’s okay. They [inaudible 00:21:14] for like 25 years and since we have small kids and they really wanted to spend more time with us, they were thinking about selling their business. But they had a very successful business. It was a franchise and so they were one of like the highest valued franchises in their chain. They were adored that everybody wanted to come to show the new franchisees what you could become and they’re kind of the stars of this universe. But nobody wanted to buy it. JM: How interesting. You, obviously, are very good at looking at strengths and weaknesses in businesses and in helping owners to figure out maybe what they need to change, where do they need to go to get the money that they’re looking for. When you’re going through that process with your mom and dad, how did that become obvious to you that the issue for them was that they may be just weren’t aware that they needed to kind of tell the story a little bit better? SS: It was really interesting because it happened over a process of a month. Have you worked with families before? JM: Oh, yes I have. SS: Okay, so you know the unique challenge because you used to work with family. JM: I’m very aware indeed. JM: Right, we don’t want to talk about this right now. SS: Right. You know there were several conversations where I was just trying to understand what they thought the value of the business was and as I started talking to them I realized that they were very focused on things like profitability—which is important—that they’d really left out two other pieces of the equation which I talk to people about all the time now, it’s what I call your “business pii”. They’re very focused on profitability. My dad was an accountant so he had tons of numbers, and I totally understood that aspect of the business, but they had left out what I call “intention” which means what is your goal? What are your objectives? How do you measure progress? How do you show that you’re actually on your way to achieving those goals? Then they’ve totally forgotten about something I call “independence” and this was the big hang-up for them. It was the fact that even though they had a team, they were talking about their business in terms of what they did. It sounded to people who are looking at the business like they were buying a job which most of the people were not really looking for, they were looking at my mom [inaudible 00:24:20]. JM: Turnkey stand-alone, right. That’s interesting, that’s such a good point that you bring that out because I think that a lot of entrepreneurs do that where in the beginning, I think especially when you are bootstrapping, we find ourselves working for whatever profit is left at the end of the day and that becomes our take-home pay. I think we do get very kind of stuck in that mode and it’s hard to step out of that where your business can run without you and I think different people have different issues with that. I think sometimes we feel like we’re the only ones that can perform certain functions within the business adequately for it to run. I think sometimes we do it because we want to do it. I know for me, I’d stay really, really involved with some of my clients especially that the service clients where we’re managing in social media or something for them because I love it, I just love it, but then you start to realize it’s not the highest and best use of your time. The business doesn’t really need you, which is hard sometimes for me to deal with, it’s like, “I’m needed, I’m needed,” but you also realize just like you say it’s like your parents are preparing to want to sell the business and people who are likely interested in investing are hearing, “I’m going to have to be here, I’m going to have to be performing these job functions,”and it’s not what they’re looking for oftentimes in a purchase. SS: Yeah, and I think the other challenge, and even when you’re looking from an investor perspective, is if you are the only person who can do that, that’s a huge risk in your business. That’s what happens if you get hit by a bus. I laughed just because in the venture capital circle, there’s a pretty well-known factor in looking at risk and it’s called the bus factor and it basically says, look at the executive team and how many of those people can get hit by a bus before the business dies. JM: Wow, that’s funny, very complicated, the bus factor, just it is what it says. SS: Right. But I do think even as a small business, it’s something we have to start thinking about because if you don’t get hit by a bus, you can certainly have an accident that puts you out for a week, and if you’re the only ones who sells, all of a sudden, all your revenues are gone for that week. JM: Or if you want to take time off, I think that’s the other problem that we paint ourselves into this corner where we feel like we can’t ever really unplug. I remember the first several years of being an entrepreneur and never being able to go somewhere without being tattered. Luckily in this day and age, whether it’s good or bad, I mean we’ve got our laptops and we’ve got cellphones and we’ve got almost constant continuous connection which can help in some cases but I think it also sort of creates some monster where you feel like you can never step away from it so that’s the best factor. It’s funny-sounded, but it’s a very important concept as we grow our businesses to make sure that they’re not dependent. I love that. We’ll make sure that we have that in our show notes for anyone listening, the business pii. JM: Yeah. Let’s shift gears, give me a couple of tips for women entrepreneurs, what advice would you offer to women when it comes to managing their money or growing their businesses? SS: I think the number one thing is you need to get past the number phobia that we talked about a little bit earlier. A lot of times, it sounds complicated, but a lot of times that can be as simple as connecting with an accountant or a bookkeeper or somebody else in the financial area who can help you understand the concepts so that the numbers become meaningful to you. JM: How do you find somebody that you’d like to help you with that? Because I think it’s one thing to say, “Go, find those people,” but what I found in my experience, and maybe you can provide some advice on finding those people, I feel like it has to be culturally a good fit, like the people that I trust with my money. First of all it’s like being naked like you have to show with somebody what you have and don’t have and maybe some of the hiccups along the way, the issues you’ve experienced. But in my mind I’ve always had to find people that I felt like culturally it was a good fit, we had the same values, the things that are important to me are important to them. How do you find somebody that you like as a good fit? SS: First off, it’s really defining what you want them to do because that’s the every other tons within financial realm is there are so many titles, there’s bookkeeper, there’s accountant, there is CPA, there is financial manager, controller. I think you need to really sit down and think about what do you want this person to do for you and then understanding what you don’t always have to do like, “This person will never be making the financial decisions in your business.” So really what you need from them is information that allows you to make those decisions and that comes down to kind of personal style. There are some people who want the bottom line, “Can I afford this or not?” and that’s the kind of person that they need to work with and then there are other people maybe like myself who are a little more detail-oriented and want to see the full picture before they make that decision. JM:I love that. It’s such good advice. SS: Yeah. I think that a part of it is really understanding how you’re going to make those decisions and what data you need to feel confident making them. JM: And then asking for them on a regular basis. SS: Exactly. Then when you’re talking to somebody pretty quickly, for example, I’m pretty sure if you’re going to bookkeepers or accountants with a list of, “Here’s what I need from you,” first off, they’re going to take you a lot more seriously. JM: I was going to say they’ll probably love you. JM: Let me sign you up. SS: Yes, but then secondly, it’s going to be great for them because there’s not this ambiguity where they feel like you’re unhappy but they don’t really know why and they’re not sure what to do about it. JM: Right, yeah, that’s great advice. JM: Right, like, “Tell me that in advance so I can find the right person.” I know for me the thought of sitting with somebody every month makes me want to freak out because I have such limited time. But I think the point is you have to know it’s to some degree what you’re looking for. I always want to be educated and that has always served me really well to find somebody where it’s like, “Will you educate me? Will you teach me along the way? I don’t know what I don’t know because I’m not you, I don’t know what you do.” I think in the early days that my big hang-up was in finding great, anything financially related, whether it was our CPA or bookkeeper or wealth advisor, I didn’t find out from them like, “Do you like answering questions? Do you like teaching? Do you like educating your clients?” When I figured out that was my priority, it was a great. I don’t have to sit with them every single month but certainly, I have a relationship with these folks where they have permission to talk to each other which has been a game changer. It’s one thing to build a team. That was my first lesson was I had to build a team. My second lesson was the team has to talk to each other because whatever change with one is going to probably change something for the other. But then, will you educate me? Now I have this relationship where I can shoot an email over to one or many depending on the situation and who I think it might impact and I would just say, “Hey, we’re thinking about doing this. We want to like pay this off or we want to make a purchase and we’re thinking about doing a credit card,” or whatever it is and are they willing to be available at least that way. Then every month getting some inputs, some feedback, maybe not from the CPA because we don’t need her as frequently unless we’re making big purchases or are looking kind of strategizing some things for our taxes but certainly with our wealth advisor, being able to just say, “Hey, every month I’d love to just have a quick touch base with you,” and it almost all happens through email. But it’s so nice because that is my accountability but also I know that they’re willing to answer those questions and to help me out. I think it’s great advice to make sure you’ll find somebody that is a good fit in terms of your values and are they willing to take their time and talk to you, educate you,sit down, and explain things, if that’s where you are in your business. Sometimes it seems like it’s tough to find but like you say, to be able to at least say, “I don’t know what I don’t know but I know that I need this information every month to make some good decisions,” really makes for an ideal client, makes for a great relationship. JM: Absolutely. There are those people who actually love doing that and we’ve been very lucky that we have found some service providers who are those folks. Actually finding the people who enjoy the educational part and answering the questions when that’s what you need is so key and so it has been really helpful. We only have a few minutes left unfortunately, and I feel like I can talk to you forever and I’m sure listeners are going to have loads of questions for you later but tell me, the final question in my mind is how do we get over the fear of the numbers and get that under control? For somebody who’s listening to this episode, if they haven’t looked at financials in a while, if they haven’t looked at their bank statements, maybe there are some businesses involved, and it just kind of grows so we don’t want to deal with it, where do we start? How do we start? What are some easy kind of next steps to just kind of get started with rounding things up and bringing it in? SS: I love that because ultimately, the key is getting started. You don’t have to finish right away but you have to at least take action. I find that quite often, if you can bring some awareness to what it is that bugs you about money, that can really help you take the judgment out of it. Sometimes it’s something as simple as looking at the numbers and saying to yourself, “I can’t do anything but ask questions,” when I look at the numbers, “I can’t make any conclusions. I can’t say, ‘Oh, that’s bad, oh, that’s good. Oh, we did this wrong.’ All I can do is ask questions.” Quite often if you just ask the questions, “What happens and where do this number come from?” that already can help you get the distance you need to not have sort of an emotional reaction and shutdown when you see the number. JM: I love it. That makes me laugh because I think I can come across pretty judgmentally when asking my questions. But I love what you’re saying. You’re bringing that awareness to just looking at and like, my God, just to have somebody make you think in those terms, stop judging it, stop judging it and just look at what it is. The only way to change it is to become aware of what has happened and that’s how you get to learn from the hiccups, the roadblocks, and the mistakes that we make financially. The only way to do it is to have that awareness and to let go of that judgment. It’s such good advice. If our listeners want to reach out to you, connect with you, or learn more about what you do, where can they find you? SS: I would love to have them go to finance-ability.com, that’s where they can take a quiz if they think that they want to look at funding, that’s a great free resource that will help them understand whether they’re ready to bootstrap, borrow, or bet because ultimately why waste your time with chasing money that’s not right for you? If there’s anyone out there who is actively looking for funding and feel like they need some personal help, I’d love for them to reach out to me directly, they can find me on Linkedin, I’m Stephanie Sims on Linkedin, they can find me on Twitter on @finance_ability, and they can find me on my personal Facebook profile or the Finance-Ability Facebook profile. JM: Awesome. We will make sure that all those links are in the show notes too. I have really enjoyed talking with you. Thank you so much for your time, Stephanie. If you would like to reach out to me or send me a message or learn more about what I do, you can visit at brandwithcatalyst.com. Thanks again, Stephanie. It was great talking with you. SS: Thanks so much, Jen. It was a pleasure.